Hello! Part of the new Avery Elle release was this adorable set called Hang In There. 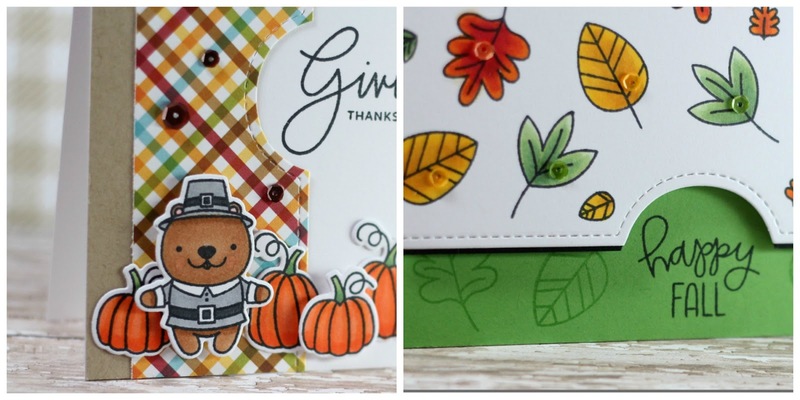 It is a small set with some amazing coordinating dies! I couldn't use this set without using all the little animals. I decided to have them all popping out of boxes! The little box die is part of the Hang In There Elle-ments. My animals were colored with Copics and a hand trimmed scarf was added to the bear. Hello! Did you survive the holiday weekend? Black Friday/Cyber Monday shopping? I survived some shopping and enjoyed a fabulous meal with my family. After this next weekend, I can fully enjoy the holiday season! A little trip for my husband and I with some friends to somewhere WARM is much needed! Don't worry, I will have blog posts ready to go while I'm gone! 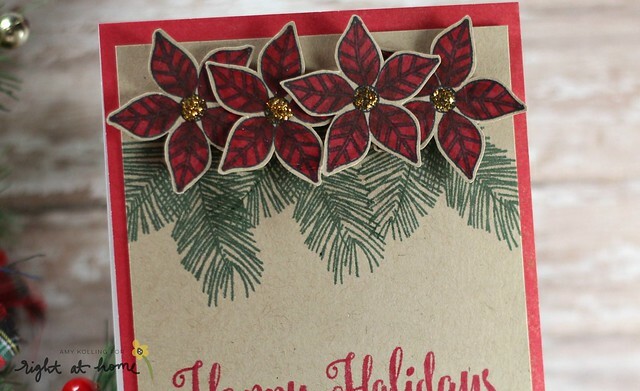 I wanted to share this little CAS number that uses some holiday stamps from Right at Home. 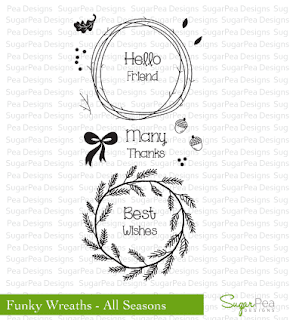 Christmas Foliage and Magic of the Season are just some great sets to own for quick and elegant holiday cards! To make this a bit easier, I wish I had the dies to go wtih Christmas Foliage but hand trimming the poinsettias was not too bad! For a little different look, I stamped all the images onto kraft cardstock. Hello! I am here sharing a card using the current SFYTT (Sketch For You to Try) over at the Reverse Confetti blog. Check out the SFYTT post......HERE for all the details! The Smitten Mittens stamp set is definitely one of my favorites this season. One reason is that you can use it in so many color palettes other than traditional holiday colors........like here.....I've used blue! Papers are from the Warm Heart paper pad, frame is from the All Framed Up Confetti Cuts, and the garland is the Double Heart Garland Confetti Cuts. 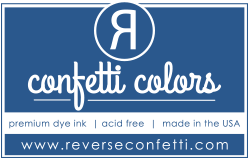 The winner will receive a $20 gift certificate to the Reverse Confetti store and claim the title of ‘Fetti Fave. 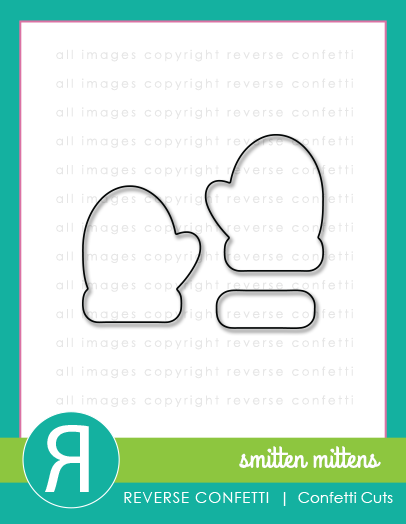 The winner of SFYTT will be posted on the Reverse Confetti blog on the 30th of each month. Check out the SFYTT post......HERE. 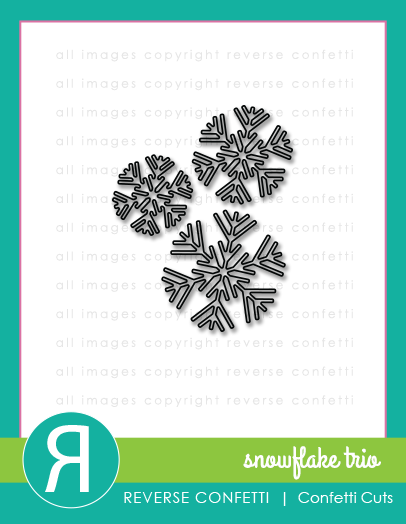 So let's see your Reverse Confetti creations this month.....you still have time to get it done! Welcome to the 25 Days of Christmas Tags featuring Pretty Pink Poshi! 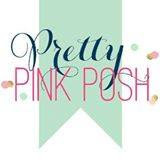 I am so happy to represent Pretty Pink Posh on this day for Tracey's event! 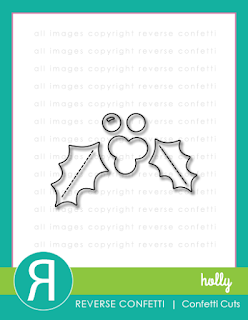 Make sure to visit Tracey's blog for all the information about the 25 Days of Christmas Tags. My tag features the Scallop Circle Dies for my frame done in silver glitter cardstock. I've white heat embossed snowflakes from Winter Wonderland and did the emboss resist technique! For my sentiment, I've white heat embossed my sentiment from Holiday Greetings onto a strip of vellum. 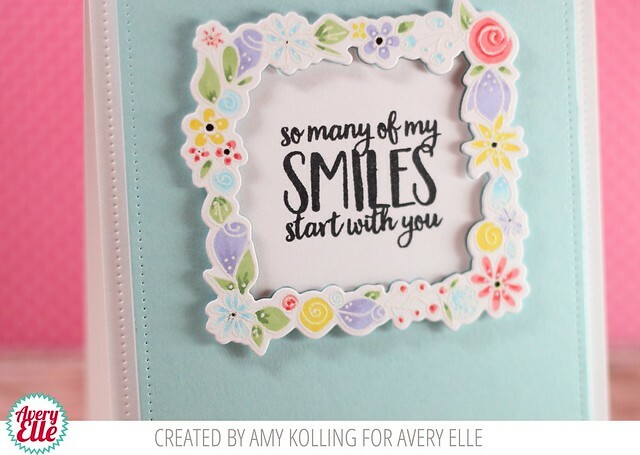 Switching gears here for a sweet post for Avery Elle using one of the new sets from the latest release. 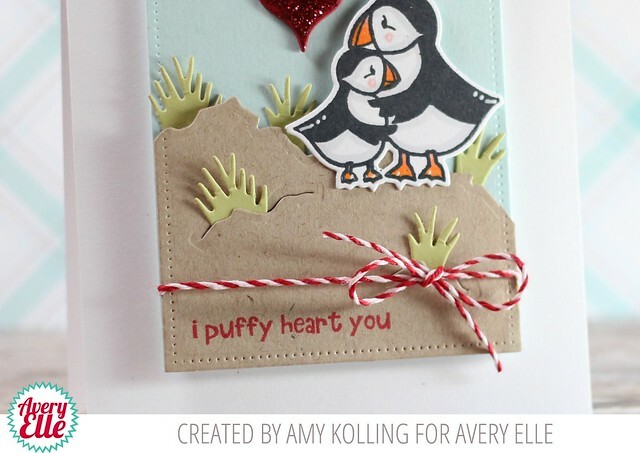 Love Puffin is a small set that is absolutely adorable! I've used some new stand alone dies called Rocky Shores to help me create my scene. 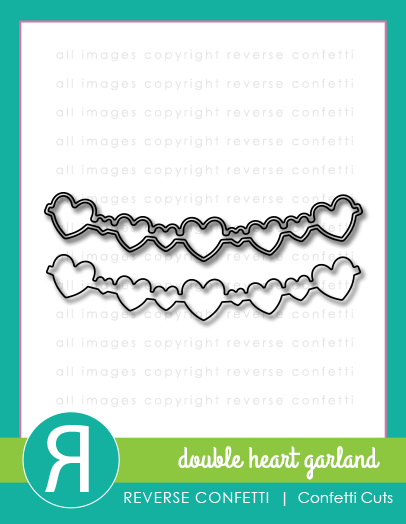 I layered several heart die cuts to make my own embellishment that I then covered in Ruby Slippers Nuvo Glitter Drops. 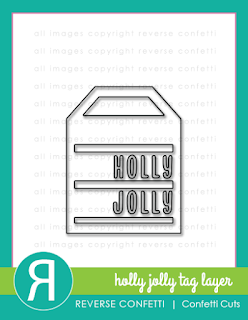 25 Days of Christmas Tags--Reverse Confetti and a SALE! 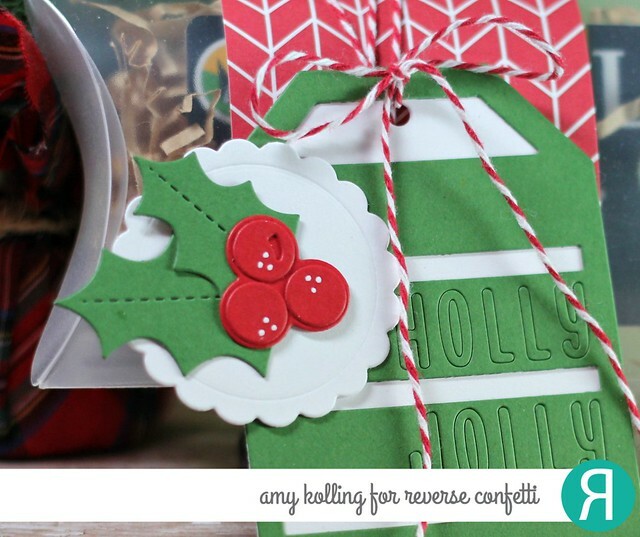 Welcome to the 25 Days of Christmas Tags featuring Reverse Confetti! 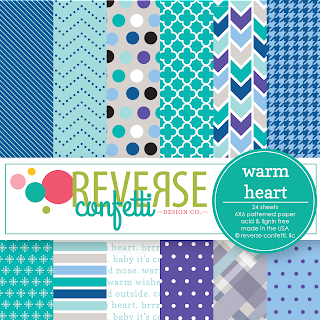 I am so happy to represent Reverse Confetti on this day for Tracey's event! 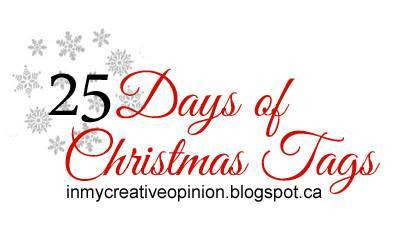 Make sure to visit Tracey's blog for all the information about the 25 Days of Christmas Tags. For my tag today, I knew I wanted to use the Topped Off Tag Confetti Cuts because there are so many layering options for this "base" tag! I chose to layer it with the 2 Way Stripes Tag Layer Confetti Cuts. One layer was done in Brick cardstock and the other in Avocado cardstock. I stamped an ornament from Vintage Ornaments in Brick Dye Ink and added a silver glittered ornament topper die cut tied off with some red bakers twine. To finish, I added a hanger from Hang Ups, Too Confetti Cuts. Hello! I wanted to share a sneak at my project that you can fine over on the Pretty Pink Posh blog for my Throwback Thursday post this month! 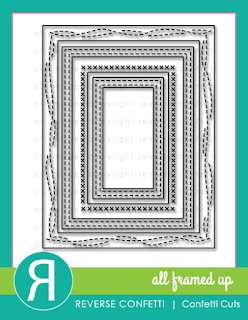 This month I focused on the popular older product called Pocket Border Die. 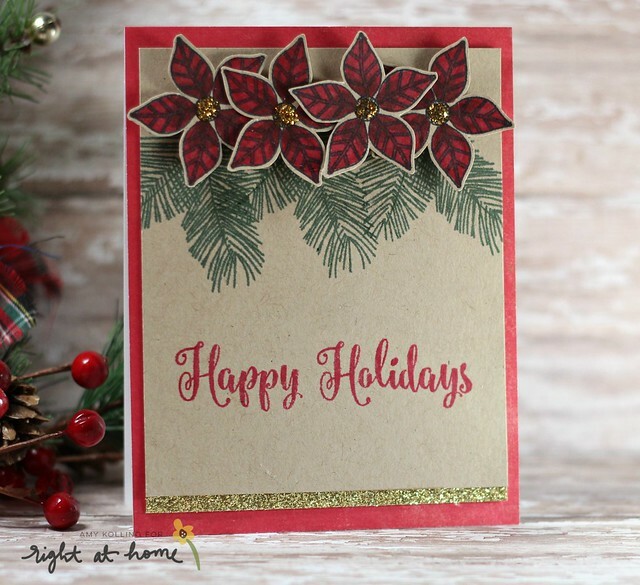 Stop over at the Pretty Pink Posh blog for the rest of my projects to see how I used this die to focus on my sentiments! Hi everyone! Have you seen the current weekly Mix It Up Challenge on SugarPea Designs? While the challenge team has made some fantastic inspiration and you need to go check it out, I thought it would be fun to share my version! I just couldn't stop looking at the inspiration photo and seeing non-traditional colors in grey and pink. 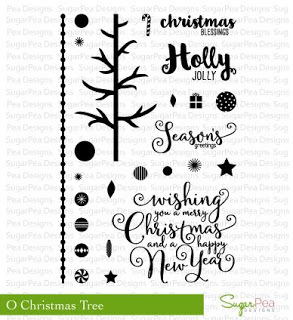 So with that, my card was started by using the Funky Wreath--All Seasons stamped in grey pigment ink and die cut. To bring in the gorgeous pink color, I stamped the bow in a pigment ink and die cut. To fill in my wreath, I simply swiped some of the same pigment ink onto a scrap piece of white cardstock and using a standard hole punch, punched out lots of pink confetti! I added my confetti as baubles to my wreath! Lots of Prisma Glitter was added using a glue pen. With the sketch portion, I took a little liberty with it and went for a larger panel behind the circle portion. I've used paper from Cedar Lane by Pink Paislee which was a perfect color match to my pink ink! For my sentiment, I positioned my wreath where I wanted to add it and stamped my sentiment, from Oh Christmas Tree, in versamark and white heat embossed. To finish, I added my wreath with foam adhesive. Hello! Welcome spring! haha.....I wish! 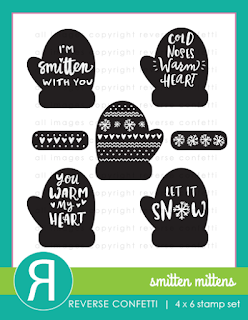 ☺ Today starts inspiration using the new Winter Release from Avery Elle! There are so many fabulous stamps and dies that were just released last week! You can find them all HERE. 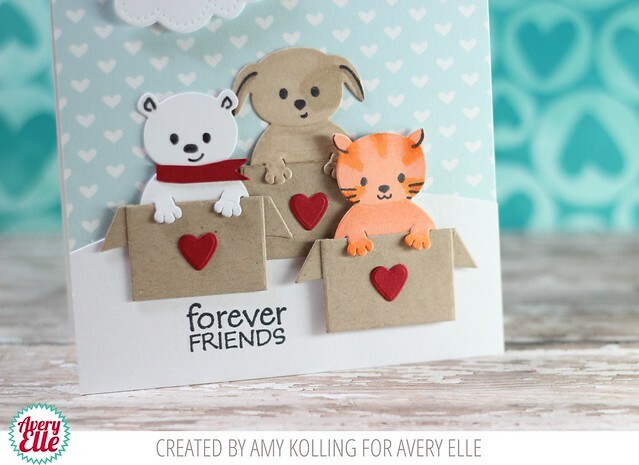 This is the card I have up over on the Avery Elle blog today. I've used the new Love Birds stamp set along with the coordinating Love Birds Elle-ments for an anytime CAS card! I white heat embossed the floral frame and colored my images with pastel Copics. To add some dimension, I added some black and white dots. I framed my focal panel with the Double Pierced Rectangle Elle-ments. Crazy for Christmas with Reverse Confetti Day 2! Welcome to the Reverse Confetti Crazy for Christmas event Day 2! 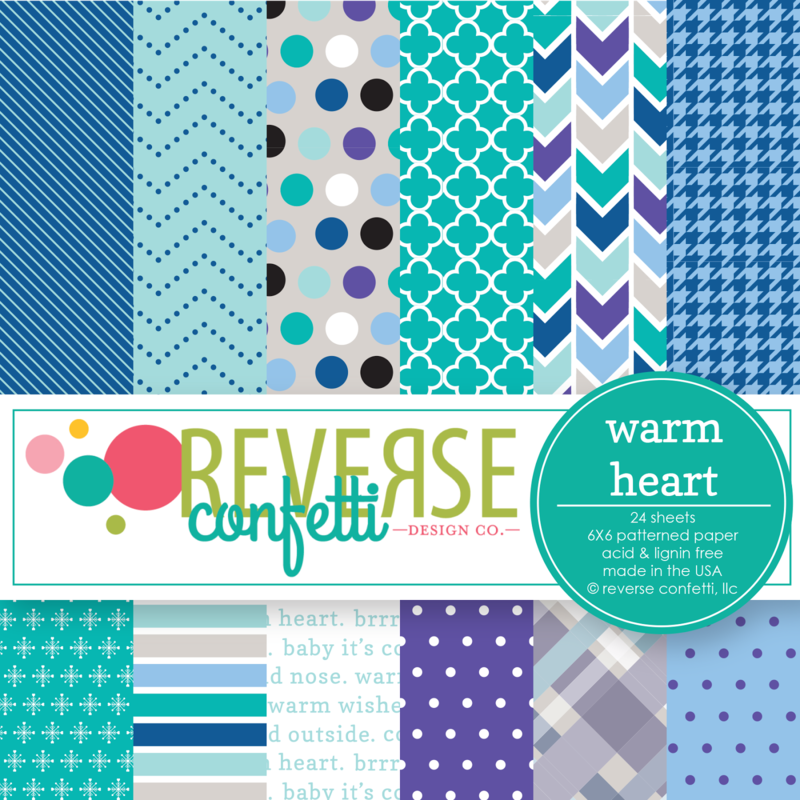 There will be TONS of inspiration using some of the newest and most trendy products from Reverse Confetti to get you ready for Christmas and gift giving! 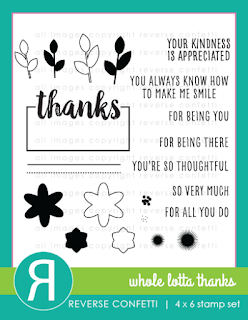 Today, I am sharing another way to gift "gift cards" that is a bit more personal! 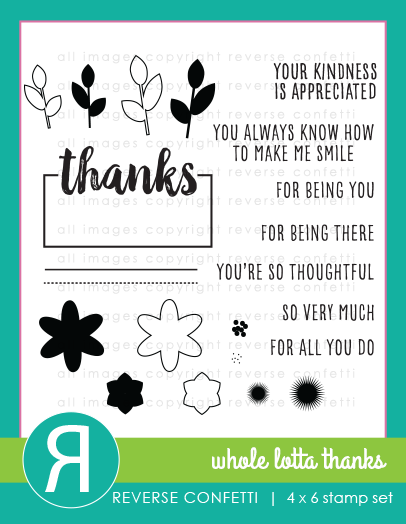 These are the perfect little gifties for a teacher, coworker, or friend! I started off with the Frosted Pillow Boxes and added a band of pattern paper from the Very Merry 6x6 paper pad. Next, I embellished with lots of Confetti Cuts and twine to attach my Holly Jolly Tag Layer. 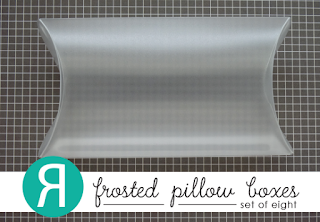 My second Gift Card Pillow Box was designed to give out at the holidays to someone that you wanted to thank for everything, This is the time of the year to do just this! 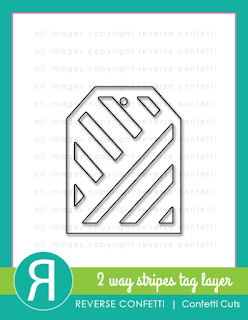 Here I've used the Whole Lotta Thanks stamp set to customize my sentiment that I attached to my 2 Way Stripes Tag Layer. 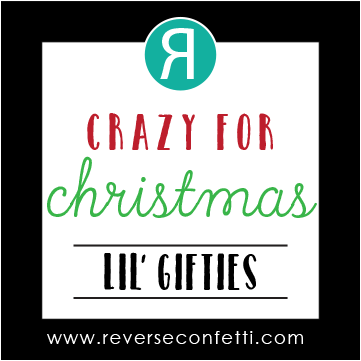 Make sure to stop by the Reverse Confetti blog for the whole list of those participating for today's Crazy for Christmas share! Crazy for Christmas with Reverse Confetti! 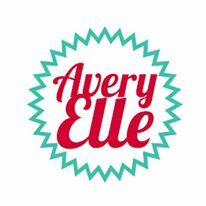 Avery Elle Winter Release Blog Hop! 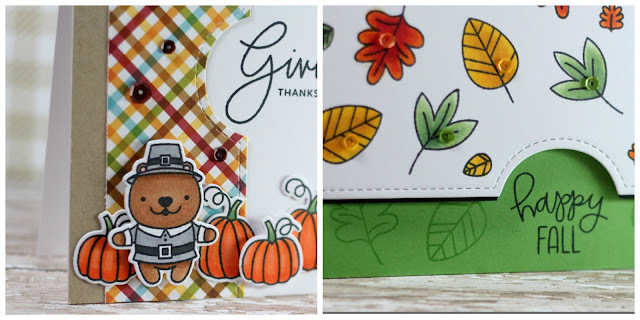 Reverse Confetti November Blog Hop!